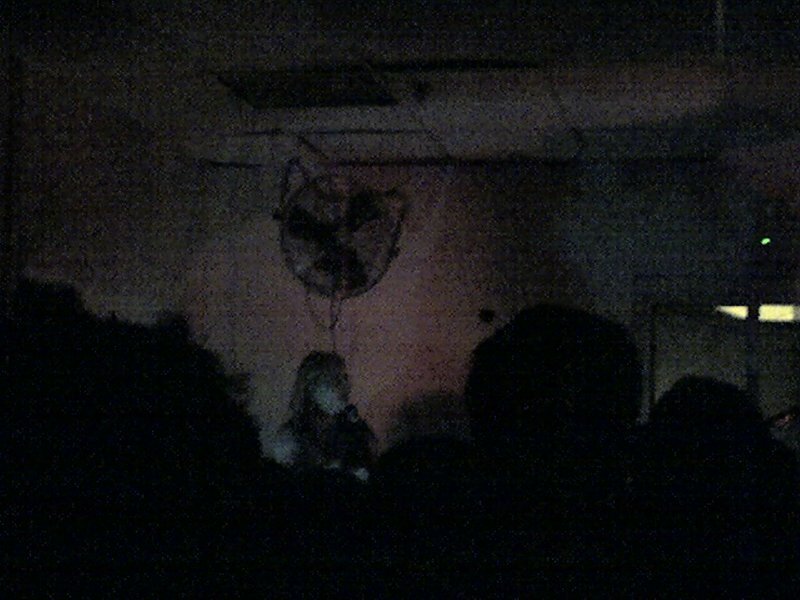 After another late night at work, I took the L train to Williamsburg tonight to a raw space called Death By Audio, located on S. 2nd between Kent and Wythe. I was first invited here last weekend by Jason, who writes a blog about seven inch records called, well, Seven Inches: an indie trend that's way bigger than you probably think. (He also writes for Loose Record, on which he kindly posted some of my pics.) 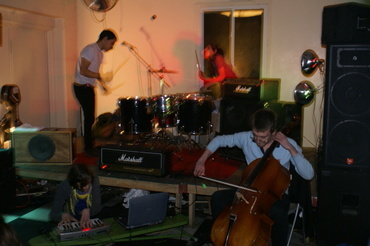 The sound here is experimental noise, and is way more vital than anything you'll hear at some sanitized Manhattan venue. It never ceases to amaze me that places like this still exist in this increasingly uninhabitable city - kudos to curator Todd P for keeping the scruff alive. 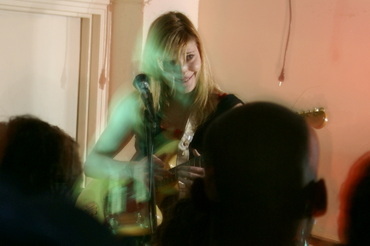 Next up is math rock singer-songwriter Marnie Stern; the last band, called, consisted of cello, synth, saw, and two rhythmic drummers. Eight bucks. No phone. Deal. Next week, the Wordless Music Series returns on Wednesday with Max Richter, Cepia and pianist Assaff Weissman playing music by Messiaen and Haydn. Then, from Thurs-Sat, Gustavo Dudamel returns hot on the heels of his NYC debut with the Simon Bolivar Youth Orchestra to lead the New York Philharmonic in Prokofiev's 5th, the Dvorak Violin Concerto (with rockstar Gil Shaham) and Carlos Chavez' Second Symphony. Oh, and if you've got an extra $5, Manny Ax is playing Beethoven and Schubert at the Peoples' Symphony next Saturday at Washington Irving High School. The week after brings the Boston Symphony to town with Jimmy Levine and Renee Fleming, followed by the Tan Dun's Water Music and The Gate with the Brooklyn Philharmonic and Michael Christie. 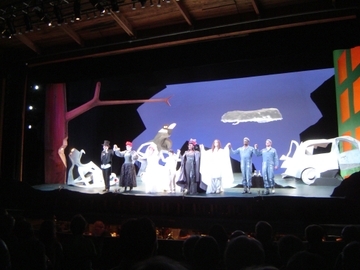 But, the main event may be later that week, when the Miller Theatre presents the NY stage premiere of Elliott Carter's one and only opera What Next?, which blew me away when I saw it in the summer of 2006 at Tanglewood (see photo below.) The final performance of the run, Dec. 11, lands on Carter's 99th birthday, and knowing Elliott, he will be there to take his bows in person. You should be, too . Adès proved himself to be a formidable pianist with a wide-ranging program that included works by Janacek, Castiglioni, Stravinsky (again! ), and a fiendishly difficult work by American composer Conlon Nancarrow, best known for his literally unplayable compositions for player piano. 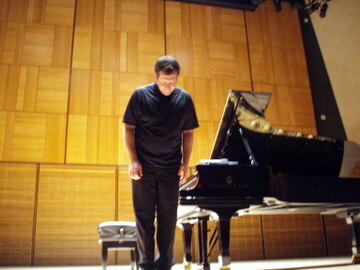 Adès also played two of his own compositions: Traced Overhead (1996), and Darknesse Visible (1992): challenging works written in his early 20's that sound easily like the work of a more mature composer. 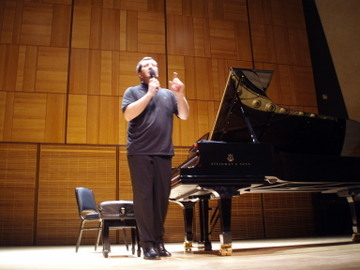 Adès said that this is the music he plays at home for himself, and he spoke briefly before each selection in a deep bass voice, offering insightful, occasionally quirky observations. Of Traced Overhead, he said: "It's meant to sound like concentric circles going up into the clouds." Adès seemed a bit awkward onstage, hunching over as if to conceal his huge frame. But, once he started playing, he seemed deep in the throes of some mystical ecstasy, his mouth open to the sky. After several curtain calls, he played three encores: a beautiful rondo by Couperin, followed by two more pieces by Janacek - the last of which, "The Golden Ring", lasted all of 20 seconds and was apparently the last thing Janacek ever wrote. Adès returns March 28-29 to conduct the Birmingham Contemporary Music Group - which he used to direct - in two concerts: one featuring his own music and the other a performance of Gerald Barry's opera The Triumph of Beauty and Deceit. Tickets range from $20-$40. For all you night owls out there, WNYC (93.9 FM) is presenting an Overnight Music Ring cycle, with tonight bringing the third of the four operas, Siegfried. (If you're not near a radio, you can listen in online now.) 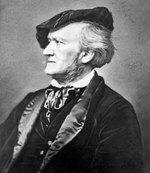 Host James David Jacobs informed us that the fourth and final opera, Gotterdammerung, would be broadcast on Wednesday night and on into Thanksgiving morning. As he put it, "The perfect music for stuffing a turkey, baking a pie crust, and settling in with your long lost relatives." Exactly.